Standard Barn – A simple and budget friendly choice, this shed is less than nine feet tall and is excellent for placements where overhead clearance is an issue. Click buttons below to see the sizes and options we offer on this model. Lofted Barn -The Lofted Barn is a popular shed with maximum overhead storage! Country Barn – This Structure has maximum overhead storage! The buildings will need to be 12′ wide or wider to fit the double doors and 2 windows in the front. Lofted Garden Shed – The Lofted Garden Shed is one of our most popular sheds! The windows and door on the side with the gambriel roof gives it a very appealing look. This shed has the maximum overhead storage! 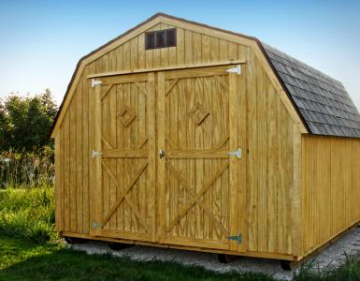 Utility – This Shed is a basic but popular A-frame shed with low cost! Garden Shed – The Garden Shed is the perfect backyard shed for all the your yard equipment or maybe just for that needed extra storage! 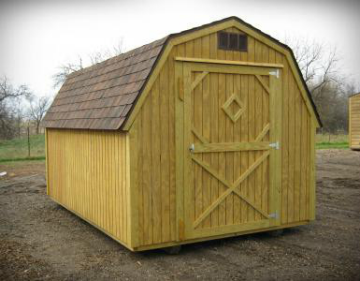 Economy Sheds – These sheds are for our budget conscious customers. Instead of throwing away our 18″ cut off pieces of siding from other sheds, we use them on these sheds.We install a z-bar trim in the splices ( note the dark lines) to ensure there is no leakage.We guarantee a well built structure! Portable Garages – The common question about our garages is, “Will it hold my car?”. The answer is with floor joists every 12″ and 3/4″ flooring it most certainly will! We would not have it any other way! If you still are not convinced we will deliver it fully assembled, with no floor, to your concrete slab. Ask your dealer about slab preparations.